and take a high-stakes test without a plan? You’d be surprised at how many people do. fail—make a plan, stick to it, and pass your test with flying colors. devote the time needed to accomplish your goal. “Days” ahead of the test? More like “weeks” or even “months.” That’s right. exam, and this book is for that person. This book is not a content review—you’ll have to use other resources for that. shown in figure 1. There’s no time like the present, so let’s get started. comes to taking your exam. Here’s how they do it. Figure 2. It takes hard work. Don’t think otherwise! which you excel and you’ll pick up lots of points there. sales people, use the power of positive mental thinking to improve their motivation. the classroom on the first day of school after you earning your teaching certificate. own leader, the leader of your own self-contained organization. Inspire yourself. the documents go in to considerable detail. Here’s how to proceed. are usually offered in PDF format at the test website. your current state of knowledge and preparation. about it but not much, and a 0 indicates no knowledge or previous exposure. topics in order from the lowest scoring to the highest. test? Here’s what you do. 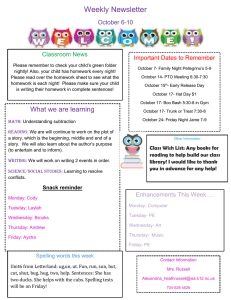 taking into account your work or school schedule, family commitments, etc. seeing movies, or other things. Save these for the after-exam celebration. out how many hours per week you have. Now you’re ready to really hit it. still need to hit, but are not going to have to work on as hard. three months before your exam date. before the exam. Not a GOOD plan, but better than no plan at all. Don’t study for more than 50-60 minutes without a break. Limit breaks to 5 minutes for every 25 minutes of study time. Quality studying is hard work so don't over do it. Limit it to 8 hours in one day. Alternate between easy and difficult topics throughout the day. Don't stick with the same topic for more than 4 hours in a row. even if you alternate it with an easy subject. 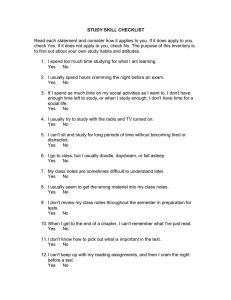 By using these methods, you'll create a study plan that is just right for you. doing what you need to do tomorrow also. instead. 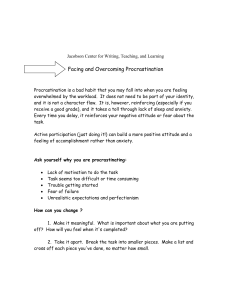 Procrastination—it's just doing the right things in the wrong order. summarizing Chapter 5 or taking another practice test). important things are at the top and the least important ones are at the bottom. off easily without getting into trouble. doing will be a more important one. What if your list of tasks looked like this? 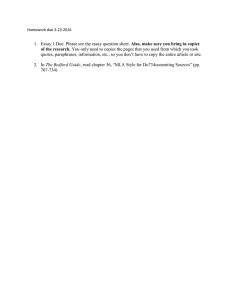 Review study guide section 3. Take practice test on Chapter 4 content. sure that you do what's really important first. do? 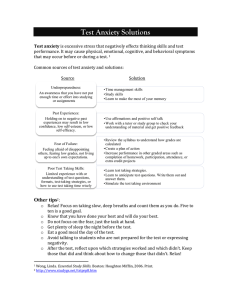 Test anxiety is one of the main reasons that you may not do well on the real test. 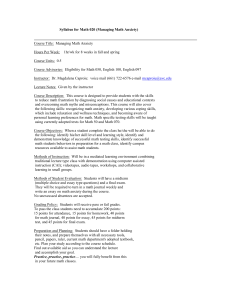 front of you or even to do effective test preparation in the first place. 1) Start by sitting in a comfortable chair in a quiet room. 2) Close your eyes and let all the muscles in your body relax. relaxes, then your shoulders, your arms, your hands. 5) Your breathing is relaxed, your abdominal muscles relax. 6) The large muscles in your back relax all the way down your spinal column. 7) Your hips relax, your legs, your feet, all the way down to your toes. on it or send it away in a hot air balloon. It's your imagination! Be creative. opportunity for you to win. imagination take you to a comfortable place. 2) Maybe you like going to the beach, a garden, a meadow, or a wooded area. Notice how relaxed and comfortable you are in this special place. ways to reduce any anxiety. and letting all the tension go. 5) You image the test as a positive opportunity. and comfortable any time you want. improve your concentration and lead to improved test performance. way I am better and better"
appeals to you. It could be a drawer, a chest, a box, whatever image you like. 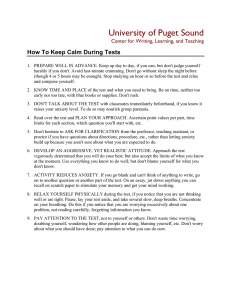 5) Also, picture yourself calm, confident, and totally prepared to take your exam. those feelings come into your mind in as much detail as possible. focused. See yourself opening your knowledge storage area as needed. will feel. While awake, reinforce and focus on only positive images of passing. as an ally to pass your exam by focusing it only on positive outcomes. Don't discount these ideas unless you have tried them. should do!). Nice idea. Everyone makes a schedule—few test takers stick to it. left); it's just about everyone. that you scheduled to complete in half an hour will take you forty or fifty minutes. abandoning time management. That's a big mistake. things you have to do tomorrow. focus on the results you want to achieve for the day, not a bunch of activities. most important to you -- like passing the test. that will yield the greatest progress towards your goal of a passing score. 9:00am Review part 2 of the study guide. 10:00pm Review calculus formula index cards. 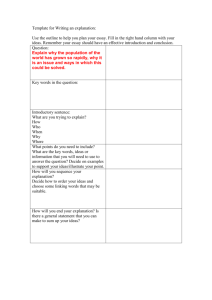 11:00pm Do the practice questions in the Comprehensive Success System. Maybe even wash the car. two to 100% completion before starting activity three. need to be put on your schedule. destroys your productivity and jeopardizes your success. not be allowed on the real exam (like an illegal calculator or notes). don’t do well on the practice test don’t panic. You still have three weeks to prepare! 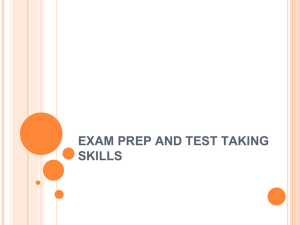 Now is a good time to add some different tactics to your test prep routine. for a software package that will do the job. cement them into your long-term memory. related information in your memory. formula will help you to find them. elimination that increases your chances of choosing the correct answer. answer choices, you could get about 50% right without even studying. to know half as many correct answers to get the same score! content of the exam won't choose it. Cross that one out first. spot two answers that look very similar, one of them is likely to be the right one. prepared or know all the answers. questions, the formula will help you. start to see a pattern. can put together the kind of answer that the examiners are looking for. to try to figure out what the most likely arguments for and against might be. schedule to run you through the last three days before the exam. on the page when you close your eyes. hammering the facts into your head. you're going to test your memory to see what you're still missing. nothing disturbs you. You want to get the timing right as well as the knowledge. 2) Make the practice test realistic—no illegal materials and use a time limit. ones you get wrong on the big day. subject on the exam) and make sure you know how to get them right next time. Figure 12. It’s getting down to the crunch. Don’t stop now! time management plan can make the difference between a passing and a failing score. end so lower your stress and so your best. Don't assume your testing room has a clock in it. So, wear a watch and use it! NOTE: Make sure you do these first two steps BEFORE the day of the exam. minutes, 120/50 = 2.4 minutes per question. the initial ATQ is 2 minutes, the revised ATQ is 1.5 minutes. There's great variety in the time needed for constructed response questions. ask others who have taken the test to get a good idea on time. TO THE CONSTRUCTED RESPONSE PORTION. that appears on your test. It is especially important that you get a good night’s sleep before the exam. do everything in your power to get a good night’s sleep. self-hypnosis and kick your success visualization into overdrive. Do a little bit of cramming to make sure that nothing is forgotten. your study guide. Go over your flash cards. and let yourself feel confident that you're going to blitz the exam. 4) You want to try to relax just before the test. end. KEEP AN EYE ON THE TIME. otherwise mark it to come back to it later. KEEP AN EYE ON THE TIME. 4) Now you've gone through your questions twice, answering the majority of them. one minute left on the test—THAT'S IT, TIME TO GUESS. 5) In the last minute, go through the test and guess on the unanswered questions. the proctor calls time. LEAVE NO QUESTIONS UNANSWERED. This example is based on a two-month lead-time. 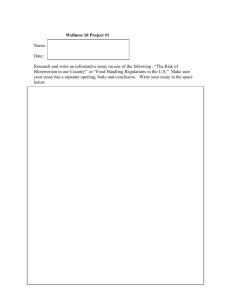 Also, make sure you bring in copies of the research.